R.I.P. to Hip-Hop Legend & Radio Personality Mr. Magic | BlackRadioIsBack.com - Official Blog of the Syndicated FuseBox Radio Broadcast! During this past weekend, the Hip-Hop & Black Music community has lost another legend with the passing of radio personality Mr. Magic. Without him and DJ Marley Marl, the radio format we now know as the mixshow would not exist as we know it today. Mr. Magic brought Hip-Hop music to the masses through his pioneering radio shows on WHBI & WBLS FM in New York City. EVERY DJ should give it up for Mr. Magic, PERIOD. That alone is enough of a great impact to Black Music to acknowledge - and then on top of all of that, his show birthed a lot of the people we call classic Hip-Hop MCs and crews today through his influence (either through compliments or a diss) as diverse as Boogie Down Productions, Public Enemy and the Juice Crew amongst many, many others. There is literally NO DJ, MC or producer that I know from the New York and New Jersey Metro areas who grew up around that way in the 1980s who do not acknowledge listening to and recording Mr. Magic's show - some of who say that kept them out of trouble due to the time it came on at night. Personally, one of the first old school Hip-Hop compilation vinyls I was ever given were the Mr. Magic's Rap Attack series. The BlackRadioIsBack.com and FuseBox Radio Broadcast family extends our condolences to his family, friends and fans throughout the years. Mr. Magic, whose panache and persistence in bringing once-reviled rap to mainstream radio in the 1980s helped pave the way for the breakout of hip-hop culture, died on Friday in Brooklyn. He was 53. The cause was a heart attack, said Tyrone Williams, his manager and producer. 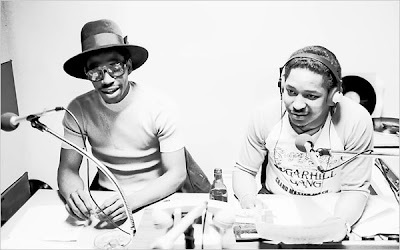 Mr. Magic, born John Rivas, was the first host on commercial radio to devote a program exclusively to rap when his “Rap Attack” began broadcasting on WBLS-FM in New York in April 1983. Disco and funk were then fading, and rap was emerging as a rebellious new art form in the streets, housing projects and parks of New York City. But many radio stations and music executives were wary of the frank explosiveness of the new music. Mr. Magic played a role similar to that of Alan Freed in popularizing rock ’n’ roll in the 1950s. “Magic was the guy who carried a flag for the music on the radio, exactly as Freed had done for rock ’n’ roll,” said Bill Adler, a former director of publicity for Def Jam Recordings. Mr. Magic looked the part of a rap impresario, wearing rings on every finger and gold rope chains. He favored a sharkskin suit. In the 1970s Mr. Magic was an itinerant disk jockey in Brooklyn, and a few small labels were starting to release rap records. He bought some late-night time on a New York public-access radio station, WHBI (now WNWK), to broadcast the new music. A few others were doing the same thing on that and other noncommercial stations. Mr. Williams said it was a lucrative concept: the station charged $75 an hour, and he and Mr. Magic charged advertisers $100 a minute. But their larger motive was to demonstrate a growing appetite for the music that created the culture of hip-hop, manifested in fashion, advertising, dance and other fields. A following grew. “In no time at all a star was born,” went “Magic’s Wand,” a 1982 song by the rap group Whodini. Mr. Magic’s big breakthrough came when WBLS-FM, a larger, mainstream New York station, decided to take a chance on rap, starting in April 1983. Soon Mr. Magic was engaged in spirited competition with a rap show on the station KISS-FM hosted by a D.J. who called himself Kool DJ Red Alert. Mr. Magic gathered a sort of hip-hop collective that included artists like Big Daddy Kane, Biz Markie, Roxanne and Kool G Rap, and was called the Juice Crew. (Mr. Magic was Sir Juice.) Red Alert was affiliated with a rap group called Boogie Down Productions. The two sides staged elaborate battles, recording songs as insults to respond to taunts from the other side. The exchanges were wildly popular, on and off the air. John Rivas was born in the Bronx on March 15, 1956. In a 1995 interview with Hiphopmusic.com, he called himself something of a hoodlum as a youth, but by the time he was in his early 20s he had a van and was working as a mobile D.J. He also worked at an electronics store, where he gave up-and-coming musicians discounts on speakers. Many rappers they presented on the radio did not have record contracts, much less fame. That came later, often abundantly. Together, the three toured the country to do what were often the first rap shows on many stations. They then sent tapes by mail to the stations so they could do more shows. In 1985 KDAY in Redondo Beach, Calif., became the first radio station in the country to adapt an-all rap format. Mr. Williams said that in 1984, WBLS wanted to abandon the rap show and offered Mr. Magic the chance to host a show playing softer music. “If I stop playing, rap will die,” Mr. Magic said, and returned to WHBI. He came back to WBLS the next year and stayed until 1989. He then worked for WEBB in Baltimore until 1992. In 2000 he left to work for WQHT in New York, a station known as Hot-97. For more than six years, he had been unable to get another show, Mr. Williams said. “I watched Magic become sadder, thinner and upset,” he said. Mr. Williams said that at the time of his death Mr. Magic was negotiating to return to WBLS. Mr. Magic was separated from his wife, Lisa Rivas. He is also survived by his sons John Jr. and Jabar, and his daughter, Domonique Rivas.